When miners Brod and Mara discover a shiny, metallic object buried deep on the forgotten planet Arweg, it begins a series of events that no one could have foreseen. The object is a capsule designed to transmit a signal which will mobilize a vast spaceship bringing invaders from the Empire. Arweg divides into two factions; those who want unification and those who believe the Empire will enslave the planet. 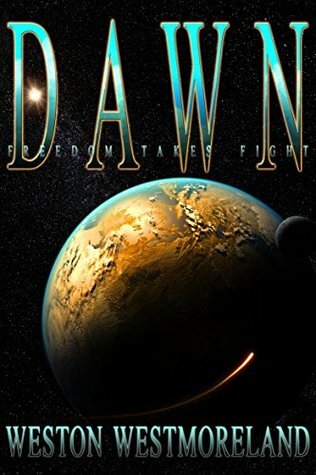 A ferocious and bloody war ensues during the dawn of this new era. First of all I must congratulate the author on the wonderful cover art that graces the front of this book. It instantly caught my attention with its simple, yet stylish, design. As a reader of many independently published novels, I've seen some ghastly covers that, quite frankly, do nothing to promote the book. This one does the job perfectly. The story is, on the whole, well-written minus a few 'clumpy' sentences here and there (a little bit of tweaking would soon fix that). The author has done a fantastic job bringing Arweg, its infrastructure and social order to life. The main characters are fully developed, although at times it's a little confusing remembering who's who with their unfamiliar sounding names and a cast of many. For a 'world building' novel it was fairly short with only 215 pages; I would've liked more of Arweg's ancient history included in the main body of the book as a premise for what was to follow. Overall, this is an excellent debut novel with an opening for further books should the author so desire. My thanks to author Weston Westmoreland for providing a copy of this book. On a planet forsaken by a pan-stellar Empire in times long forgotten, old stories tell of an infamous day when swarms of imperial starships clouded the sky and abducted all able men and women. Nothing was ever known of them thereafter. The planet, known as Arweg, was left stranded, inhabited only by orphaned children, the unlearned elderly, and the helpless. Years went by, the old died, and the children grew to become adults in an ignorant world surrounded by crumbling technology they were unable to understand and much less operate. After ages of darkness, civilization reemerged to a point where a small portion of the little technology preserved in time could be worked. Two young Arwegians unearth a metallic capsule and trigger a chain-reaction. The strange pod will relay a signal into deep space and summon an immense octopus-shaped starship known as Goddess. The Empire is back, and it wants to restore Arweg to its former status as a full member of the Confederacy. It is the Dawn of a new Era. Or is it? A voice from the past will warn the Arwegians the real purpose of the Empire is to modernize the planet only to make it suitable for a renewed colonization and slavery. Some will believe it and some will not. The Revolution has begun.